We’d love your help. Let us know what’s wrong with this preview of The Invisible Hook by Peter T. Leeson. Pack your cutlass and blunderbuss--it's time to go a-pirating! The Invisible Hook takes readers inside the wily world of late seventeenth- and early eighteenth-century pirates. With swashbuckling irreverence and devilish wit, Peter Leeson uncovers the hidden economics behind pirates' notorious, entertaining, and sometimes downright shocking behavior. Why did pirates fly fl Pack your cutlass and blunderbuss--it's time to go a-pirating! The Invisible Hook takes readers inside the wily world of late seventeenth- and early eighteenth-century pirates. With swashbuckling irreverence and devilish wit, Peter Leeson uncovers the hidden economics behind pirates' notorious, entertaining, and sometimes downright shocking behavior. Why did pirates fly flags of Skull & Bones? Why did they create a "pirate code"? Were pirates really ferocious madmen? And what made them so successful? The Invisible Hook uses economics to examine these and other infamous aspects of piracy. Leeson argues that the pirate customs we know and love resulted from pirates responding rationally to prevailing economic conditions in the pursuit of profits. To ask other readers questions about The Invisible Hook, please sign up. A discussion of pirate practices and why they were sound rational decisions by economical rules. Covers such things as the reasons for their strict pirate code, and why they elected their captains and quartermasters and divided power between them. The logic of the Jolly Roger, which had the effect of saving the lives of both pirates and merchant sailors. The dilemma of torture -- on one hand, the passive resistance of hiding booty could make seizing the ship unprofitable, on the other, a reputati A discussion of pirate practices and why they were sound rational decisions by economical rules. Covers such things as the reasons for their strict pirate code, and why they elected their captains and quartermasters and divided power between them. The logic of the Jolly Roger, which had the effect of saving the lives of both pirates and merchant sailors. The dilemma of torture -- on one hand, the passive resistance of hiding booty could make seizing the ship unprofitable, on the other, a reputation for torturing captives inspired resistance even when it was almost certainly hopeless. Brands -- like Blackbeard's. The value of a reputation for insane violence. Why most pirates were volunteers and neither forced men (if white) nor slaves (if black), and why there is such a tendency for them feign having been forced. It has some flaws. True, studying the Golden Age of Piracy has its points, but there have always been pirates, and it might be appropriate to mention that. It doesn't discuss how the small size helped -- sometimes 300 or so, but still small when discussing an entire society. And the treatment of slaves assumes that slaves can not be treated well, even as equals, which is not, historically, true. This book is far more interesting in its discussion of pirate history and culture than in its discussion of economics. The economics discussion is extremely rudimentary, and anyone with even a passing interest in the subject will not find it helpful. In addition, the author displays some biases in his own schools of economic theory. Finally, the reliance on the rational actor was a bit extreme, and ignored important modern research about the way large groups of people act irrationally. Dr. Leeson This book is far more interesting in its discussion of pirate history and culture than in its discussion of economics. The economics discussion is extremely rudimentary, and anyone with even a passing interest in the subject will not find it helpful. In addition, the author displays some biases in his own schools of economic theory. Finally, the reliance on the rational actor was a bit extreme, and ignored important modern research about the way large groups of people act irrationally. Dr. Leeson is no doubt aware of this research, and perhaps he omitted it because it muddies a discussion that he wanted to keep clear and as straightforward as possible. Nevertheless, I think the phenomenon is worth a mention. Econ: Using the rational choice model to analyze pirate behavior is just too cool for words. He goes over a whole bunch of intro economic concepts but hey with pirates as the backdrop its just way more appealing. Also as Leeson says, much of pirate behavior is pretty inexplicable or apparently insane unless one applies the economic way of thinking. In the light of (Austrian) economics however, pirate social organization just seems to be the logical outcome of a particular set of unusual historical circumstances. Liberty: Probably the coolest aspect of the book imo is the chapter explaining how pirate societies are veritable proofs of the viability of a stateless society. In short, his argument is that pirate societies faced the same economic problems which "legitimate" societies face, and they were able to successfully solve them through private models of governance. Furthermore, pirates were as pure of egoists as we could possibly procure so if *they* could get on fine without descending into a Hobbesian war of all against all the "legitimate" societies probably could as well. This also makes Dan D'Amico's work on prison social organization (conveying pretty much the same point) all the more interesting. 2 case studies of less-than-kind people creating an ordered anarchy purely out of self interest! History: Leeson is not a historian, so he leans (by no means exclusively) on secondary sources. However theres still a helluvalot to learn here about pirates. For instance the differences between corsairs, pirates, privateers and buccaneers. Or the details of the "pirate codes". Or what tactics pirates would use to escape legal punishment in the event that they were captured. Also, it's title is just too clever for words. Be prepared for plenty of wordplay if you venture forth. This review has been hidden because it contains spoilers. To view it, click here. Somehow it feels as though this book would be more satisfying if it were about something completely void of character or intrigue. As it is, there's enough fascinating historical information (especially in the afterword) to make Invisible Hook just interesting enough to be let down by. Upfront, Leeson's careful and selective application of rational choice theory to pirate history, results in that just-so narrative typical of pseudo-scientific pop-lit (think any pop book on evolutionary psych, or Somehow it feels as though this book would be more satisfying if it were about something completely void of character or intrigue. As it is, there's enough fascinating historical information (especially in the afterword) to make Invisible Hook just interesting enough to be let down by. Upfront, Leeson's careful and selective application of rational choice theory to pirate history, results in that just-so narrative typical of pseudo-scientific pop-lit (think any pop book on evolutionary psych, or paleo living). While the, at times obscene, practice of historical cherry-picking can be looked over for the most part (heck, the very expectation of it is the selling point of the book), the absurdly shoehorned concluding chapter about piratical management, is almost painful to read. Along those lines, and before moving on to my major complaint with the book, there's a rather odd section where Leeson seems to gush impotent rage at views of a high prevalence of homosexuality amongst golden age pirates. It's not clear if the motivation behind this passage is some personal issue with homosexuality itself, or a halo-effect around some idealized vision of pirates he holds, but whatever the inspiration it's a jarring passage. The way his tone completely shifts from the rather consistent blend of nerdy-professor/first-time-pop-author, to angry kid defending his favourite superhero from bigoted slanders on the playground, is really off-putting and seems completely out of place in both the chapter, and the book as a whole. Many of Leeson's authorial sins in Invisible Hook, were to be expected given his anarcho-capitalist leanings, but capital among them, and unforgivable, was making such naturally captivating subject matter so boring. Since starting this book, months ago, it's been a struggle to find the motivation to grind through a few pages here or there during any given week. Really, for such a short book about such exciting subject matter, the dullness is criminal. The Invisible Hook offers a unique take on pirates, applying basic economic arguments to explain their behavior. Leeson has a funny and enjoyable writing style. People who appreciated books like Freakonomics and people interested in applying economic analysis to nonstandard settings may want to read it. Unfortunately, the book is somewhat bloated. 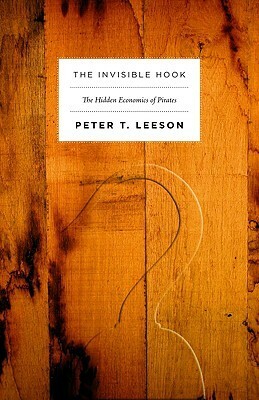 It originated in a few papers by Leeson, and there is not enough material here to extend into a whole book, and I sometimes felt like he was trying to The Invisible Hook offers a unique take on pirates, applying basic economic arguments to explain their behavior. Leeson has a funny and enjoyable writing style. People who appreciated books like Freakonomics and people interested in applying economic analysis to nonstandard settings may want to read it. Unfortunately, the book is somewhat bloated. It originated in a few papers by Leeson, and there is not enough material here to extend into a whole book, and I sometimes felt like he was trying to force the facts into the economic framework just to elongate the book. More problematically, he often overstates his case in making his arguments. For example, Leeson laments the fact that people assume pirates usually tortured because they were crazy, when they actually did so to intimidate their adversaries thus making plundering easier. Leeson goes too far in the other direction, however, claiming without any data that most pirates were rational and the crazy ones were anomalies. More generally, Leeson's confidence in analyzing pirates as rational agents, obscures important aspects to explaining criminal behavior such as psychological motivations. Leeson's economic analysis often comes off as simplistic or even strange. He confidently cites a theory about the costs of discrimination, affirming that this should usually lead to the erosion of discrimination, but does not mention empirical or experimental work (for example, see Mullanaithan) on discrimination in hiring. Particularly odd was his analysis of externalities. Reading the section, I was left with the impression that Leeson thinks well-defined air property rights will more effectively address pollution than will regulation. There are two ways you could happen upon this book. You could either (1) be interested in economics and want to know how it applies to pirates, or (2) be interested in pirates and want to know how economics can make sense of pirate behavior. I came into this book from option (1), and I think my experience suffered from it. Don't get me wrong - this was an EXTREMELY entertaining book, and I learned more than I ever thought I would about pirate customs and institutions. That being said, I think th There are two ways you could happen upon this book. You could either (1) be interested in economics and want to know how it applies to pirates, or (2) be interested in pirates and want to know how economics can make sense of pirate behavior. I came into this book from option (1), and I think my experience suffered from it. Don't get me wrong - this was an EXTREMELY entertaining book, and I learned more than I ever thought I would about pirate customs and institutions. That being said, I think this book can best be thought of as a fantastic introduction to the economic way of thinking via a person's interest in pirates. Peter T. Leeson spoke at my college when I was a freshman (six years ago now) and I went for an extra credit in my gen ed econ class. His talk was so memorable that even six years later, when I needed to research piracy and wanted a unique angle, I remembered him and purchased his book. It didn't disappoint! THE INVISIBLE HOOK provides a very interesting look into the life of pirates, examining the role of economics in everything from self-governance to torture. While maintaining a conversationa Peter T. Leeson spoke at my college when I was a freshman (six years ago now) and I went for an extra credit in my gen ed econ class. His talk was so memorable that even six years later, when I needed to research piracy and wanted a unique angle, I remembered him and purchased his book. It didn't disappoint! Excellent book. It was a rollicking good time. To be fair, though, I'm also an econ nerd, so I think that freakonomics is a little too light on the regressions and heavy on the clickbait. In other words, this was a really fun book to read, but I'm the target audience, and your mileage may vary. But if you want an interesting inspection of economics through the lens of pirates, this is a good one. Short read, too. Before I watched Black Sails, pirates never held much appeal for me. Black Sails changed my whole idea of what historical, or historicist fantasy, fiction could achieve. It creates exactly the kind of intricate and compelling web of cultural, political, economic, personal, and ecological forces that I sort of had at the tip of my tongue but wasn't quite confident could be such a perfect fit for dramatic and adventurous drama. And the key to that whole web was piracy. The Invisible Hook dives int Before I watched Black Sails, pirates never held much appeal for me. Black Sails changed my whole idea of what historical, or historicist fantasy, fiction could achieve. It creates exactly the kind of intricate and compelling web of cultural, political, economic, personal, and ecological forces that I sort of had at the tip of my tongue but wasn't quite confident could be such a perfect fit for dramatic and adventurous drama. And the key to that whole web was piracy. The Invisible Hook dives into the forces and mechanisms that make that web so dynamic and interesting and brings them out in isolated causal terms. In subject and content, it was exactly what I was hoping it would be. In execution, Leeson is often a tad over-popularizing for my level and tastes. It's not just that he takes the time to define concepts I'm already familiar with; though a lot of the concepts he applies are fairly 101, the review is not unwelcome and obviously necessary for many readers. There's just often a sense that he either thinks he's wittier than he is, or feels he needs to try to be wittier than he should. Overall, that's a minor complaint. The writing is very clear and rarely too obnoxious or clever. The material I was less familiar with was, unsurprisingly, the most interesting. I haven't read very much political economy, and honestly wouldn't have been able to define it very well before. Now I feel like I have a much better sense of what it is about. Pirates provide a great case study in political economy because some of the major philosophical pitfalls of thinking about nation states simply don't apply to them. In both political science and economics, we often have a tendency to put the moralistic cart before the mechanistic horse. We come in with the assumption that the purpose of both government and the economy is to achieve some morally optimal endstate. But when you're talking about pirates, that starting point would just never occurred to you. The conversation begins with the understanding that violating moral norms is not an inherent barrier and that the chief purpose is self-interest. In other words, it begins from an ecological perspective. Leeson doesn't frame his discussion in terms of multilevel selection or cultural evolution. He talks about the Federalist papers and profit-seeking. But it's clear enough that that's what he's talking about for me to make the leap. In that sense it forms a very useful bridge between something I was already very comfortable with and something that I didn't realize was essentially asking about the same problem. So most of the book is spent detailing how pirates derived behaviors we think about in moral terms, like democratic checks and balances, racial equality, social insurance, and equal pay, as solutions to collective action and cooperation problems. The fact that many of these institutions were developed not through moral reform or by implementing the ideas of a political philosopher, and often in absence of, or even contradiction to, existing social norms and traditions, suggests that those are in fact never the most important factors in driving or permitting the adoption of such practices. In short, it points to a theory of morality and governance driven entirely by the tension of individual self-interest and group success, according to which justice and equality emerge not from the courage of good men but from the net costs and benefits of achieving them. The problem is that Leeson only seems to grasp this idea intermittently and incompletely. Instead, he presents the idea with a strangely inconsistent libertarian slant. He never comes out and says anything like "ancap-syndicalism worked for pirates so it could work for everyone"; in fact, he explicitly states quite the opposite: hierarchical structures are more efficient and therefore appropriate under different cost-benefit scenarios. But his ideology does intrude on the text in weird ways. For instance, he presents piracy in contrast with the "legitimate" economy, which of course he sees as the engine of all prosperity. He describes many of the ways in which the "invisible hand of the market" increases overall well-being among pirate crews, but makes no secret of the fact that piracy itself is nothing but a drain on the wealth creating power of the legitimate economy. The confusing part is that he seems to largely take it for granted that the legitimate economy is, if not perfectly calibrated, at least generally organized to benefit people in general. That is, he treats non-piratical economic activity as fundamentally distinct simply because it is legal. This is a pretty dense book that covers only "golden age" piracy. I'm listening to it as an audiobook off and on, which is not ideal reading conditions, and yet I find that it is a wonderful thought-provoker on many levels and has sparked many interesting conjectures on long drives. The prose is often slyly hilarious, and I'm definitely glad I'm dipping into it. Not committing to finish it, but honestly, it doesn't feel like something I need to be linear about. This book is wonderful in every way. Peter is an excellent author because he makes a concept like spontaneous order to digestible using a real-world example. Granted, as a reviewer, I am not extremely fixated on spelling and grammar. I was told there is at least one glaring error I totally missed. However, I don't care. This book is excellent. Peter takes you through the realities of the world of pirates. The economic choices they made and the reasoning behind it from a practical standpoint. Eve This book is wonderful in every way. Peter is an excellent author because he makes a concept like spontaneous order to digestible using a real-world example. Granted, as a reviewer, I am not extremely fixated on spelling and grammar. I was told there is at least one glaring error I totally missed. However, I don't care. This book is excellent. Peter takes you through the realities of the world of pirates. The economic choices they made and the reasoning behind it from a practical standpoint. Even if this book was just to bust the myth of pirates, it would be marvelous. However, the book goes so deep into that world that I find it just captivates. It's like having so many pop culture illusions shattered and I love that. The economic premise of the book is amazing. Finally an author who points out the economic reasons people make decisions and how people will tend to come together for mutual benefit to improve the outcomes for all involved. Many people might think, "well this only applies to law-breaking pirates." Yet, Peter demonstrates it doesn't only apply to law-breakers. These concepts clearly can be applied to everyday behavior. This book examines the behavior of 18th-century pirates through an economic lens, demonstrating how many of their seemingly bizarre behaviors were actually quite logical given the unusual conditions they worked under. It also illustrates how pirates pioneered concepts like democracy and racial integration, not for noble reasons, but because they made economic sense. It's a fascinating read, although it occasionally feels a bit padded. Each chapter ends with a summary, and then much of this materi This book examines the behavior of 18th-century pirates through an economic lens, demonstrating how many of their seemingly bizarre behaviors were actually quite logical given the unusual conditions they worked under. It also illustrates how pirates pioneered concepts like democracy and racial integration, not for noble reasons, but because they made economic sense. It's a fascinating read, although it occasionally feels a bit padded. Each chapter ends with a summary, and then much of this material is summarized again in chapter 8, a syllabus for an imaginary course on pirate management. Chapter 8 is also where the author awkwardly inserts his own political views, using the pirates' use of self-regulation to argue that corporations should be allowed to self-regulate and that the ADA should be abolished. It's a bit of a non sequitur, and I kept thinking, "I get it. You're a libertarian. Can we get back to talking about pirates, now?" It also seems a bit odd to use the example of people who stole from the populace -- until eventually restrained by the government -- to argue that the government should not exercise restraint on corporations. Surely they have the same theft-inducing incentives? In spite of these flaws, it's a fascinating read and brings a lot of insight into why pirates operated the way they did. Well-written and interesting. It is heavily based on Austrian economics, and uses that as a basis for analyzing how the pirates behaved. However, me being already familiar with Austrian economics, it felt like the book was a bit too elementary and dragged on for a bit too long. I found the historical facts about the pirates very interesting though, and I think it would have been better if the author had toned down the economic discussions and reasonings. Not a very good book. Basically, pirates practiced economic thought. This isn't a new revelation. Nor, as the author tries to say, is this a different form of economics. Adam Smith didn't make up Economics. He, in a sense, helped discover it. Economics always existed. Thus, it is obvious that pirates practiced economic thought. If you know basic economics and anything about pirates, than you could make these connections on your own. Supercilious. This author simplifies and underscores every point until you wonder if his intended audience consists of mentally handicapped first graders. Sound economic theory and history, packaged in an irritatingly condescending manner. I would recommend this for middle school kids, but I suspect most kids get sick of being talked down to. Solid pop culture read. Enjoyed the pirate stuff more than economics. Def intended for general audience. Overall the book does manage to be both entertaining and educational. Perhaps embarrassingly for a profession economist, the weakest parts of the book are when Peter 'steps back' from pirates and tries to explain the economic principals he's applying to pirates in a modern context. This is both far less interesting, and done somewhat ham-fistedly. There is also a tenancy with academic authors to structure their chapters as essays, with a 'tell them what you're going to tell them; tell them; tell Overall the book does manage to be both entertaining and educational. Perhaps embarrassingly for a profession economist, the weakest parts of the book are when Peter 'steps back' from pirates and tries to explain the economic principals he's applying to pirates in a modern context. This is both far less interesting, and done somewhat ham-fistedly. There is also a tenancy with academic authors to structure their chapters as essays, with a 'tell them what you're going to tell them; tell them; tell them what you told them' format that breaks up the flow for general readers, and results in a boring and unnecessary recap of what we just read as the 'conclusion' to each. The book had me until it launched into an abrupt and uncalled-for argument against Burg's ideas and then dug itself in even deeper with the entire section on women pirates, never even trying to tackle, say, the treatment of disability aboard (which would have been actually super interesting through the economical lens!). Too bad, bc otherwise this would have been a good transitional book from popular fiction to a more informed perspective of golden age pirates. It was a fun read. At times, it was repetitive and could have used a good editor. Not many new economic insights and other reviews are correct that the author seems to have to work a little too hard to make Pirates seem fully rational. But it is a set of readings from which I can choose assignments that may be a little more intriguing than some standard economic papers..
Who would have thought there would be a book about pirates like this! Alright. Very shallow though and kind of a free market fundamentals masked with some pirate stories. The most enjoyable book on economics I have ever read! Built on a cultural backdrop of an era that vividly juxtaposed the early beginnings of radical changes in the concepts and practice of government and freedoms (civil, political and economic). As the book mentions the piratical societies were the pioneers, by decades, of the practice of our current forms of freedoms, governance and government. The author proposes a theory that explains how these changes and practices came about through a single unifying logic of self interest whether in the form Built on a cultural backdrop of an era that vividly juxtaposed the early beginnings of radical changes in the concepts and practice of government and freedoms (civil, political and economic). As the book mentions the piratical societies were the pioneers, by decades, of the practice of our current forms of freedoms, governance and government. The author proposes a theory that explains how these changes and practices came about through a single unifying logic of self interest whether in the form of self preservation or profit maximization. As is any other economic theory, the theory is built on the foundational assumptions that we are rational and self interested - both are highly controversial and heatedly debated. Though strong arguments can be on either side of the debates on an individual level, aggregating individuals to successive levels of organization quickly introduces and shows other complications in the concepts of rational and self interest. The piratical societies are no exception, not least because they are a society of outlaws, indentured and enslaved individuals. The normal social rules that enable the sustaining of a society like trust, fairness and reciprocity are non-existent or at least very weak. It is true that piratical societies did denounce and fight the feudal and monarch systems of the day and did form for short periods of time libertarian societies that either couldn't support themselves for long or were crashed prematurely; but examining the context of the period and the relatively close timelines between the establishment of these piratical libertarian societies and the establishment of the more liberal societies in the continental lands suggest that these liberties have other social, economical and political common origins other than the economic's almighty natural law of self interest and self preservation. Why this theory is weak is because it does not account for the fact the piratical era was relatively short and without social and political constraints of the already established system on the continental lands, the time required to develop and experiment with these new libertarian concepts is not enough which hints to, as mentioned, to common origins which may well be other than self interest. From the generally good reviews this book received I began it expecting some nuance in Leeson’s approach to analyzing the phenomenon of late 17th century and early 18th century pirates, yet I was quite disappointed by what I found. Leeson warns us in the preface that he is no historian, so one should perhaps not harp on the unsophisticated approach to writing something that at times approaches an economic history, but I was genuinely surprised at the mechanical approach by which Leeson invoked b From the generally good reviews this book received I began it expecting some nuance in Leeson’s approach to analyzing the phenomenon of late 17th century and early 18th century pirates, yet I was quite disappointed by what I found. Leeson warns us in the preface that he is no historian, so one should perhaps not harp on the unsophisticated approach to writing something that at times approaches an economic history, but I was genuinely surprised at the mechanical approach by which Leeson invoked basic principles of economics in an attempt to explain pirate behavior. Several chapters, particularly chapters 5 through 8, reminded me of final class essays that an undergraduate student of economics might write in an artificial attempt to apply economic principles to various situations without taking the care to find nuance, or to question whether or not there is enough evidence that the basic assumptions implicit in those economic principles hold in the particular circumstances. This is an interesting, quick, and not particularly well-written book. It could easily have been 5 stars, but the author plays into a lot of popular journalism tropes, trying to be overly-cutesy in a way that just makes me groan. A good example of how this actually can be somewhat distracting is when he introduces the rational choice model. Leeson feels the need to bring up the assumptions that underlie the rational choice model. Unfortunately, the fact that he's trying to write for a general aud This is an interesting, quick, and not particularly well-written book. It could easily have been 5 stars, but the author plays into a lot of popular journalism tropes, trying to be overly-cutesy in a way that just makes me groan. A good example of how this actually can be somewhat distracting is when he introduces the rational choice model. Leeson feels the need to bring up the assumptions that underlie the rational choice model. Unfortunately, the fact that he's trying to write for a general audience makes it so that he introduce the concept that the analysis is done with the assumption that people are rational without making it clear what the implications are. It's a common mistake that is made - people feel the need to enumerate their assumptions because they are scientists, but don't make clear that their conclusions might not be significantly changed by changes in those assumptions. There are similar problems throughout the book - trying to briefly introduce a concept superficially and going into just enough detail to get people in trouble. I'm also not 100% convinced of some of the cases he makes in the book as well - particularly the signalling theory with the Jolly Rogers. His case is that the signal is costly because non-pirates would face harsh punishment if they flew a jolly roger (as a de facto admission of piracy), but I don't really see how committing intermittent acts of piracy is any less likely to brand someone a pirate than flying a flag. Again, a bit more detail would be interesting, because this seems like an obvious objection. That said, it seems quite possible that the jolly roger could be a costly signal - given that pirate ships tended to be much faster than merchant ships, the fact that you are confident enough to warn your prey before coming upon them could well have been a costly signal. This book grew out of an academic paper, and its origins are very apparent in the "finished" product. The info and conclusions in it are very interesting, and it definitely gives a much richer view of the pirate life, but it suffered a few annoying flaws. The most notable flaw is the overuse of fractured quotation, which clunkifies the narrative immensely. Every time I encountered quotations, I felt "quite irritated at how this broke up ideas" and "even though it may have been necessary in acade This book grew out of an academic paper, and its origins are very apparent in the "finished" product. The info and conclusions in it are very interesting, and it definitely gives a much richer view of the pirate life, but it suffered a few annoying flaws. The most notable flaw is the overuse of fractured quotation, which clunkifies the narrative immensely. Every time I encountered quotations, I felt "quite irritated at how this broke up ideas" and "even though it may have been necessary in academia" it was "annoying" and "unnecessary" in a book for a lay audience (see?). To make matters worse, these quotations are almost always written in the archaic form, which further obfuscates the ideas presented, and act like literary speed bumps. How about you just paraphrase and annotate? Speaking of annotation, fully 1/3 of the length of the book is bibliography or references at the end, so the actual content is quite short. I think this book could have been lengthened and vastly improved by employing the following structure: Chapter starts with a complete narrative or anecdote on a piratical exploit, then, anecdote is dissected to elucidate economic machinery behind decisions made, with perhaps supporting snippets from other unrelated exploits. As it stands, while the book is broken up into logical sections that each focus on particular economic concept, only snippets of various story are ever told, and this is done using the aforementioned annoying quotations. I realize that in an academic paper, retelling a story is unnecessary when you can just reference, but this is a book, not an academic paper.